To be honest I’m not the biggest fan of the ToG covers. Although I do like the typography of the title, which gives off an ancient and regal vibe. The arc of fire is cool too since Aelin is able to control fire, and the gray scheme goes well the the overall arc of the book since war is looming in their future. Wow. Just wow. Sarah J. Maas has created another incredible installment in the Throne of Glass series. Before starting Empire of Storms, I would recommend rereading the series or even just Queen of Shadows. You’re instantly thrown back into the world of Throne of Glass, so I found the beginning to be a bit slow because my mind was trying to remember all the characters. Sidenote: If you haven’t already read The Assassin’s Blade, I would highly recommend picking it up to get a better understanding of some of the characters and story. In Empire of Storms, Aelin is trying to rebuild her court while fighting the threat of Erawan and Queen Meave. We are able to delve even deeper into the world Maas has created, and learn more about the horde of characters she has introduced to us. 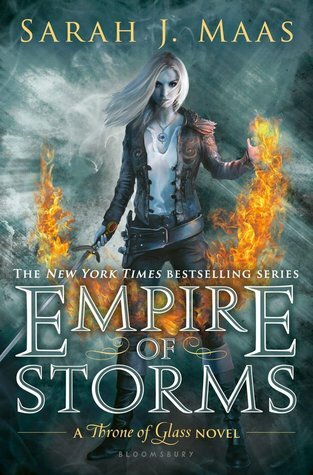 While Empire of Storms delivers the expected action, romance, adventure, frustration, and bewilderment, what stood out to me was my grown interest in each individual character. In Heir of Fire and Queen of Shadows I begrudgingly read chapters that weren’t directly associated to Celaena/Aelin. Chapters from Manon’s POV never really interested me, but in Empire of Storms I became invested in each character’s own plotline. There are a ton of characters and different POVs in Empire of Storms, which made it difficult to follow at times, but it allowed for a better understanding of the whole story. Not only does Sarah J. Maas allow us to follow Aelin’s journey, but the multiple intersecting journeys of each character in this story. I’m glad there was so much character exploration and growth in Empire of Storms because I became more attached to characters I had no interest in before. I cannot wait to see all of them in full action in the final book! Despite its slow start, there was plenty of action throughout Empire of Storms. Not only was it awesome to see all the different character’s abilities and powers, but there was plenty of secret scheming occurring in the background. There were plenty of surprises in the book that Aelin kept hidden, which made for an exciting and eventful read. Sarah J. Maas did a wonderful job with the character development and the relationship growth in Empire of Storms. There are plenty of Rowan and Aelin scenes, which made me want to reread Heir of Fire to relive how their romance began, that will leave Rowaelin shippers (is that their ship name?) definitely happy. And there are a few unexpected romantic matches that pop up that I surprisingly enjoyed. Also the camaraderie between all the characters was great. I love Aelin and Lysandra’s relationship, and it was interesting to read about the dynamic between Rowan and the rest of Maeve’s cadre. Empire of Storms was a great addition to an already spectacular series. I’ll admit I did have a hard time getting into the beginning due to my forgetful mind, but after some chapters I was once again sucked into this epic world. For me this book was one of the game changers in the series. It helped refuel my interest in all the characters and the ending left me dying (no joke) for the NEXT BOOK! Honestly one of my favorite fantasy series I have ever read, and this book was no disappointment. There is so much adventure and love and action and witty retorts and secret plans that readers will not be able to get enough of Aelin and the rest of the characters in Empire of Storms. WHAT DID YOU THINK OF EMPIRE OF STORMS? Are you a fan of sarah j. maas? do you enjoy the tog seris? I still haven’t read this series!!! OMG!!! Nonetheless, this was a great review. I’m super eager to read it even more now. ohmygosh! I would definitely recommend this series, especially if you’re a fan of fantasy. The ToG series is seriously amazing, and it’d be nice to binge read all of them before the final book comes out! Hope you pick them up soon and enjoy them! LOVE HER TOO!! She’s just a great writer, and I’m so glad you got hooked on this series. I agree that it went from YA to new adult without warning, but I didn’t mind it too much. Although I do agree that it sometimes felt cheesy at moments. And I totally agree!!! I miss his character and I think he was a central part of the story, who shouldn’t have been left out. Ahhhh I can’t believe it’s going to be the final book!!! Thanks for stopping by Kelly!